This product was added to our database on Friday 12 April 2019. 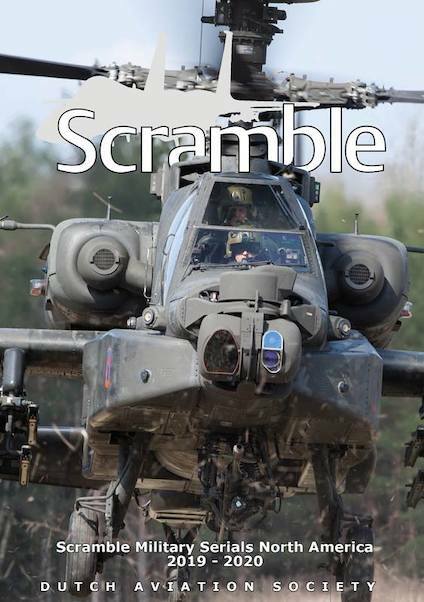 After seven years of absence, we are pleased to introduce a new edition of the Scramble Military Serials - Northern America. Again a lot of hard work and effort went into making this book as accurate and up-to-date as possible. In this all new publication you will notice that we have changed the presentation of the content to meet the wishes of our readers. We decided to leave the last noted date of each individual aircraft out so we can present the rundown divided into two columns, just like that other must have, the Scramble Military Serials - Europe. Included in this 223 page edition are United States Air Force, Navy, Marines, Army, Coast Guard, NASA and Canada. For every branch all types are listed that have at least one aircraft of that type active as of 1 February 2019, not including those only used by technical schools. The OrBat of both countries is included. Per state is listed which units are based at the various locations. The US Customs and Border Guard aircraft are not included.